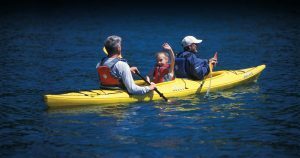 Kayaking can be a wonderful experience for the entire family. However, unlike organizing a kayaking trip with adults, a trip with kids will involve a bit more planning. Here are some areas to consider. Kayaking lessons – Before you plan your trip, you and your family should book kayaking lessons. These are often done at community pools and can provide your children with much-needed experience and skills for their trip. It is also important to add a few strength training workouts before your trip to strengthen older kids and yourself. Planning the trip – Firstly, parents who have no kayaking experience should not consider taking their children with them. If you are new to kayaking, try experiencing kayaking on your own, with your partner or with a friend before including your kids on the adventure. Location – Choose a location where the water is calm with minimal currents. Look at protected bays, lakes and slow rivers. As your family gains experience, look at more challenging locations. Bathroom breaks and diaper changes are an important part of traveling with young Speak to our experienced kayaking personnel at Crystal Seas for locations with appropriate facilities. The length of the trip – The length of your kayaking trip will have to be short, as young children will get tired and have a short attention span. As a rule of thumb, look at shortening your trip to 1/3 of your usual distance when kayaking with children.